second straight pole position of the formula one season at the malaysian grand prix. The briton button grabbed his fifth career pole ahead of toyota driver jarno trulli a week after winning the season-opening. Australian GP from first place on the grid for the former Honda team.”two poles on the trot, iI have never acheived that before. 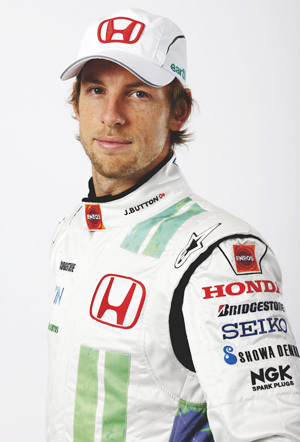 It is a great feeling and shows that the car works on diffrent circuits,” said the 29-year old button. The top teams of ferrari and mclaren, meanwhile, lagged behind again. Kimi Raikkonen placed ninth while ferrari partner felipe Massa, the 2008 pole holder in sepang,went out in the first round in 16th place. world champion lewis Hamilton and mclaren team-mate Heikki Kovalainen placed a modest 13th and 14th,respectively.Raikkone will start from seventh place and hamilton will move up one place on the gid because the third placed qualifier sebastian vettel of germany was docked 10 places for his role in a race collision in australia and brawn GP driver Rubens Barrichello drops from forth to eihth over a gearbox change. Button, meanwhile, was the pacesetter again as he was clocked 1 minute 35.181 seconds for the 5.543-kilometers lap in hot and humid conditions to lead from trulli (1:35.273) and vettel (1:35:581). ” We didnt really know where we were (after modest results in fridays practice). But jenson had a great lap. our drivers are gaining in confidence,” said team boss ross brawn. Button will have to on his guard against toyota duo of trulli and timo Glock, who was bumped from fifth in qualifiying to third on the grid over the penalties for vettel and barrichello. While Ferrari and McLaren aim for the first points of the season, Vettel sets his main hopes in possible rain for Sunday’s race over 56 laps to make up for his loss of 10 positions.